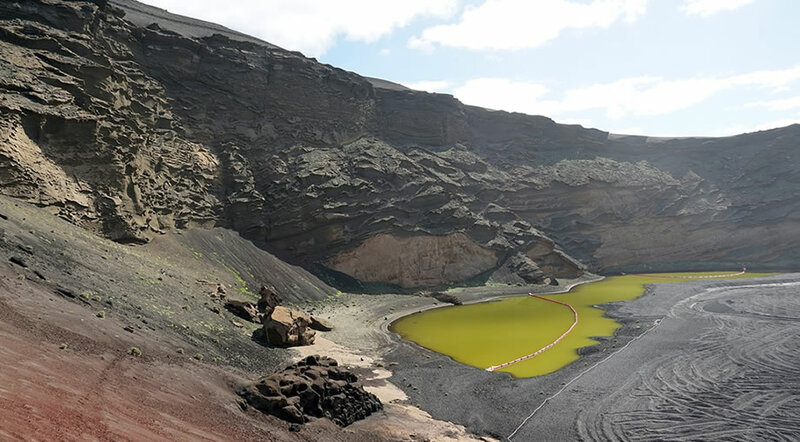 On the south west coast of Lanzarote, in the municipality of Yaiza, close to Los Hervideros (another must-see place on the island) you can find the Green Lagoon, also known as El Golfo. This place actually goes by many names and it's also called Charco de los Clicos or the Green Lake / Lago Verde in Spanish. El Golfo is a green lake, formed in the crater of an old volcano and it owes its colour to a type of algae that grows there. After the eruptions in 1730, the crater of the volcano has been flooded and so the green lagoon was formed. Even today the lake is still connected through the underground with the ocean, which is how it maintains its water level. The green color of the lagoon is in great contrast with the deep blue of the ocean and the entire landscape, with the volcanic rocks in the background, provides a very unique sight. El Golfo has been declared a nature reserve and so now it's forbidden to swim in the lake, which is why it's surrounded by a wooden fence. From the parking lot there's a dirt pathway that takes you to the viewpoint from where you can admire the lake and take the best photos. Since Lago Verde is situated on the west side of the island, it is a great place to come and watch the sunset, especially because the area becomes very quiet and the bus tours are gone, so you're likely to be pretty much alone. The area surrounding El Golfo is also very attractive for jewellery makers, who come here to find green stones that they can use for making pendants, bracelets or earrings. If you go to a local market like Teguise Market and see handmade jewellery pieces with green stones or volcanic stones, this side of the island is most likely the place where they were collected. The name El Golfo actually belongs to the small village situated in the close proximity of the lagoon. This used to be a fishing village and some fishing is still being done today, so after visiting this side of the coast you can make a stop in the village for lunch. Best thing to try here is fish dishes and seafood, which are supposed to be some of the freshest in Lanzarote. The atmosphere of the restaurants here is very different from what you would find in most resorts and many locals eat in the restaurants here, so it's interesting to try a new experience. There's even a small hotel in the village, called El Hotelito del Golfo, where you can spend a few quiet days in Lanzarote, away from the noisy resorts.